This was a playoff level game in Week 12…Seattle would have likely been kicked out of the playoff picture with a loss here. Carolina, with a win, likely locks in/looks good for a wild card spot. Carolina needs wins now because they have the Saints twice the final 3 weeks of the season. This game was punch-counterpunch. Two ‘C+’ level teams duking it out. Back and forth all game. Carolina led 13-10 at the half. 20-17 Carolina after three quarters. It was 27-27 late, and Seattle had the final drive…down the field, into FG position, and they hit the game winner. Seattle has two key wins in-a-row, two wins with late game drives to win it – beating GB and CAR the last two weeks, both wild card hopefuls that Seattle has an edge over now. Seattle is 6-5, likely headed to 9-7 and the last wild card spot. Seattle has three easy wins on the schedule ahead…SF, SF, ARI. They also have two losses…MIN and KC. 9-7 is definitely in their grasp. If they beat Minnesota Week 14…then they are a lock for the playoffs and possibly the #1 seed wild card (which is important to avoid going to Chicago and going to DAL/PHI/WSH). Carolina is fading fast. Playing sloppy football on top on injury issues hurting them (and have all season). Carolina falls to 6-5 and we project them to 8-8 now…out of the playoffs. Three weeks ago, Carolina looked like a #1 wild card. Three losses in-a-row later and they’re out. Even if Carolina gets to 9-7…Seattle will be 9-7, most likely, and now has that edge. Carolina can change everything if they can beat the Saints at Carolina on MNF Week 15. I bet they don’t. I also bet they lose to the Browns the week prior. I think I’ve published enough words on Curtis Samuel (1-25-0, 2-17-1/2) this year. I think you know where I stand. No reason for me to write more glowing words about him running the ball for 10+ yards every time he gets a chance (and complaining that Norv won’t use as a runner but once every 2-3 weeks). Nor is there reason to point out that he had another TD here…and then go into his amazing TD-to-touch efficiencies. We know all this. 1) With Funchess out, Samuel played a career high 92% of the snaps in a game…exactly what I wanted. Except…he only saw two targets and one carry. I’m furious at this touch counts, but…it’s a step in the right direction. Had Funchess been out, and Samuel played his 15-20 snaps as Torrey-Jarius played 90%+, then there would be little hope with Samuel this season. Before Josh Adams forced his way to the top, we had to do a slow, small-step, silly dance of limited touches for a while. 2) Samuel had three targets in this game, actually, one was lost to a P.I. Here’s the thing…when Carolina gets into the red zone and throws – Cam Newton is looking for Samuel almost exclusively among WRs (that’s why his receiving TDs are popping…not ‘luck’). First time it happened in this game, Samuel ran a slant to the middle and broke the CB’s ankles with the cut – an easy score. Next time throwing in the red zone…alley oop to the tiny Samuel, who again broke ankles, got open, Cam under-threw it, P.I. on the recovering defender who crashed into Samuel, who nearly made a stunning catch anyway. CMC then got the 1-yard score. It was Samuel who got them there. Samuel is piecing together future greatness…a master at running the ball, plus the key red zone threat for Cam. All we’re missing now is Cam going to Samuel more between the 20s, instead of just when things are tight. Samuel gets open almost every play, an excellent route runner and best hands on the team. We’re getting there inch-by-inch. It’s a slow, painful process to watch NFL coaching fools…and it always happens this way with Norv. We still have hope for a huge upswing…but we’re still at Norv-risk. All the ‘between the 20s’ throws seem to go to D.J. Moore (8-91-0/9, 1-7-0/1). I know for sure, Samuel is a better WR than Moore…but I also know that does not matter. It’s obvious the coaches want to run things with DJM between the 20s. Moore has been sloppy, erratic, looked-lost a lot this season…but also flashes athletic brilliance at times. I’ve fought DJM because of lack of consistency and Samuel being clearly better. However, he finally put two back-to-back games of goodness together. I still say he’s a risk for a 2-21-0/5 next week, if Funchess is back…as it can be with Cam and/or DJM. Cam is erratic in targeting one guy as well. However, I felt like I saw some ‘it’ with Moore here…in the sense that he’s the perfect WR of the future. Sure, his hands are shaky sometimes and he’s not a great technician at WR yet. That’s all great scouting but in an era of passing ease/favoring WRs…all DJM needs is the ball. He’s built like a high-end RB for after the catch. If you judge him as a Larry Fitzgerald or Curtis Samuel, he fails to compare. If you look at him like small Quincy Enunwa or WR-version of Alvin Kamara – then we have a different opportunity. I don’t trust Cam to use it consistently yet, but I’m getting on-board. I missed it this time because while everyone was picking him up, because I turned my nose up at the inconsistency of results…and that may be right going forward 2018. I’ll just wait for the next 3-33-0 game or two and then make my move if people turn on him. I don’t think he’s a must-have, yet, but someone nice to have long-term/dynasty as a nice new era WR that the team forces the ball to. 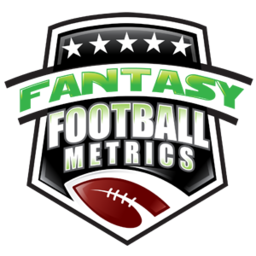 -- I had sold some Christian McCaffrey (17-125-1, 11-112-1/11) the past few weeks during his TD frenzy, but after a break from scoring TDs last week he’s back at it again. I got great players in exchange, which was the point, so I can’t complain…but looking at this week (forgetting his weak prior week), damn…I would have liked this stat line this particular week. Odd side note…McCaffrey fumbled three times in this game…didn’t lose any of them. -- You holding Rashaad Penny (4-4-0, 0-0-0/0) in redraft? It’s gotta be frustrating. No matter how good he looks, he is pushed to the back of the line. I don’t think Penny will matter at all this season, because if Chris Carson (16-55-1, 2-8-0/2) goes down they’d probably split Penny-Davis. However, Carson keeps taking big hits (because he’s not elusive) and also is fumbling more and more. I want to quit Penny, but the odds are so high Carson gets hurt/lost for a week/weeks/the season, in some barren RB places I try to hold hoping for things to break my way. -- UDFA WR Malik Turner (1-19-0/2) caught a pass early in this game for Seattle. If you went, “Who the hell is Malik Turner?”…then, you joined me with the same sentiment. I know everybody in the NFL, and even I was like, “Who?”. 2016…48 catches, 712 yards, 6 TDs in 11 games. Better numbers, right? How about those 6 TDs happened within Illinois’s 13 TD passes on the season? That’s a nice ‘TD share’. It’s possible Turner is a good receiver who got lost in a terrible college offense his entire college career. Good hands. Very thin frame. Probably a high 4.5s runner…maybe even 4.6+. Kinda has a Geronimo Allison vibe – reliable but not enough of an athlete to get open easy in the NFL or run away from people after the catch. I’ve been talking about it for weeks. SF-MIN-SF-KC then next 4 games. The two SF games are juicy. The 49ers are trying to lose for the #1 pick, so Mullens is likely to stay in – and that’s GREAT for the opposing DST. Seattle, now, has EVERYTHING to play for…and has a decent defense. Find another defense for Weeks 14-16 to pair with Seattle’s Weeks 13 and 15, as many of you have been for a while. Seattle has MIN and KC Weeks 14 and 16…and that may not be as great for their offense. If Xavier Rhodes is good-to-go, Week 14 is trouble for the WRs, in general, because it’s not great for Wilson. Week 16 might be ‘OK’ if KC doesn’t need the game or might be nice in a shootout…but KC’s defense is getting stronger and Eric Berry should be back then too. It’s not a ‘great’ end of season schedule but not bad, in general. Carolina has @CLE, NO, ATL in Weeks 14-16…and CLE and NO are not pushover defenses. They’re on the rise. If Funchess is out and DJM draws Ward-Lattimore-Trufant, that’s not good. And it’s all clear for CMC in these matchups but the Saints are pretty tough on RBs…but CMC is almost matchup proof.